Hyderabad, Mar. 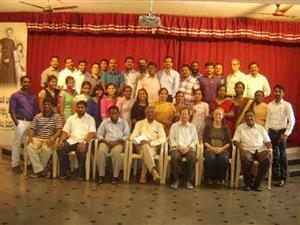 18: Participants of the Participatory Action Research (PAR) project from the southern Salesian Provinces of India had a three day training programme at Don Bosco Navajeevan, Hyderabad, 16-18 March, 2015. The PAR method seeks to empower the child and make the child an important stake holder in all matters concerning its growth and welfare. The whole project is carried forward under the auspices of Don Bosco National Young at Risk (YaR) Forum. Besides the animating team of Prof. D. Manti and Fr T.D. John, and the three project coordinators, there were 35 participants in the programme. During the three day interactive and demanding programme, the researchers were initiated into the skills of aquiring data by means of interviews, surveys and observation techniques, and analytical study and the process of evaluation. The most important was the initiation session wherein the researchers were briefed about the very concept and rationale of PAR: seeking Action, through Research and in a Participatory manner. Prof. Manti stated that the method was born in the field of rural development and is now being replicated in other fields too. The latter halves of the three days were allotted for practical sessions and assignments while the morning sessions focussed on the theoretical inputs. Besides this there was also discussion on the ethical practices involved, a sharing of experiences and information material. A very enriching mingling of Priests, Religious and lay people (Christian and non-Christian as well) as equals was another remarkable feature of the programme. The strategy of PAR challenges the myth that the child is ignorant and thereby dependent, and incapable of making decisions for itself. The project at hand is to initiate PAR in at least ten of the Young at Risk (YaR) settings and then replicate it across India. For this Prof. Manti challenged the group to take the side of the disadvantaged, identify the issues and seek adequate solutions for the same, all in a participatory style, with the child and its welfare as the primary concern. During the three year span of the project, the intent is that the ideology catches up and comes in vogue in all our undertakings across the region. Though it is the YaR settings that is the primary focus, there were also members from the Human Rights and personnel formation sector too drawing lessons. The subsequent training programme is slated for the beginning of next academic year.